Our budget was small when we gave our hall bathroom a makeover. Sending a kid to college doesn’t leave a lot of wiggle room for home improvement projects! But we completed our update for less than $200. I’ll be sharing our projects over the next few weeks, starting with instructions for how to paint cabinets. Stay tuned for the final reveal at the end of this month! Our three teens share this hallway bathroom in the mornings. They all have different showering schedules, and we do have other showers in the house so there’s never been a problem. Well, almost never. They’re siblings so there’s going to be a little squabbling sometimes. But we figured sharing a bathroom builds character, right? When my son left for college this past fall, the girls and I decided to give the space a little makeover. It was a great project to keep all of us busy and not focused on missing him. The first project we did was paint the room. The girls and I decided to use shades of gray with some pink accents for decoration. We painted the room with Benjamin Moore’s Horizon. It’s a really pretty, pale gray. Benjamin Moore’s Aura paint is my absolute favorite paint for walls. It’s definitely pricier. But its coverage is ahhh-mazing! A cheaper paint would’ve needed at least two coats to cover the darker blue. We only needed one coat with a few touchups. The girls had a lot of fun doing the painting! They took turns rolling and brushing. They had tried painting before, but this was the first room they did on their own. I love empowering them so they can know how to do these types of things when they have homes of their own. And I don’t really love painting, so I was happy to pass the baton, er, roller! We completed the whole makeover in just 2 days, but there were several projects that went into the rest of the makeover. 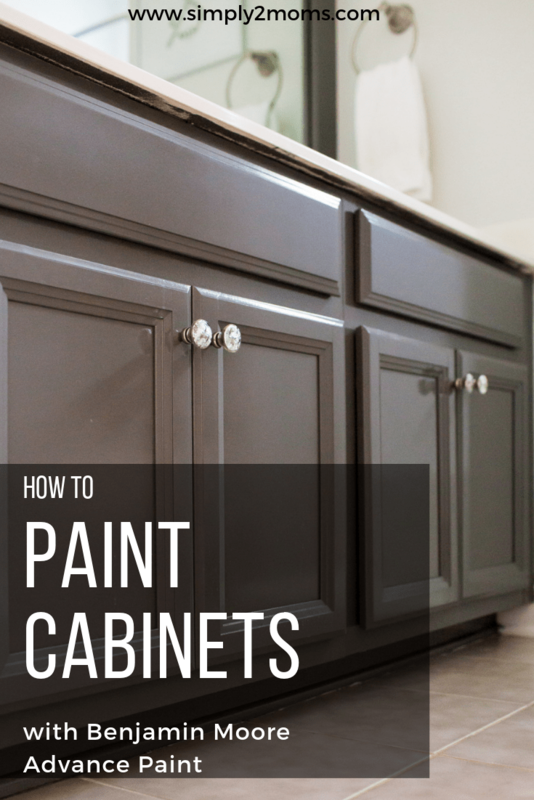 Today we’re taking a look at how to paint cabinets. Here they are in their orangey wood glory. Before beginning to paint our cabinets, I did a lot of research. Some sources recommended lightly sanding the cabinets beforehand. But I chose to use a good primer that didn’t require sanding. In fact, they recommended not sanding because it can allow the tannins to leach through the paint. I used Zinsser Bulls-Eye 1-2-3 PLUS Primer. It’s a zero-VOC water-based primer which means it’s safe to use (non-carcinogenic) and easy to clean up. That’s always a key for me! First, we removed the doors and all the hardware. Then my husband set up a painting station under a canopy so that he could use the paint sprayer that attaches to his air compressor. We live in North Carolina and we did this project in August, so it was HOT outside! Thank goodness for canopies and shade. He used wire hangers through the hole where the knobs attach to hang the doors. That way he could spray both sides at the same time without extra drying time. Isn’t he clever? You can use a brush to paint the doors, but spraying gives a really smooth finish, and it’s SUPER FAST! Which is always a bonus. After the primer had completely dried, it was time for the paint. I decided to use Benjamin Moore’s Advance Interior Paint in a semi-gloss finish. I wanted to have a little bit of a shine in the space. Plus, I was a little skeptical that it would be as wipeable as I wanted it to be in a more matte finish. This water-based alkyd paint is so cool! It dries to a hard, furniture-like finish, just like an oil-based paint does. But it is easy to clean up and is low-VOC since it’s water-based. Basically, it takes the best qualities of both types of paint and magically combines them! We wanted a bold color, so we chose Kendall Charcoal. Kevin painted the doors outside with the sprayer, and I painted the frames inside with a brush. This paint has great self-leveling qualities so even if you use a brush on your doors, you shouldn’t get visible brush strokes. We let the doors cure for a week before re-installing them on the cabinets. You probably don’t need to let them cure that long, but we decided to err on the side of extra time to cure. 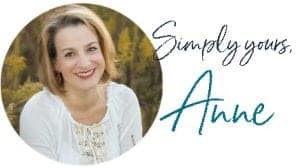 I’m not a fan of having to do touch-ups! And our kids are old enough that we don’t need to worry about having the cabinets open. The girls and I liked the idea of giving the room some feminine touches and a little shine, so we chose mercury glass knobs for the doors from Hobby Lobby. I absolutely love how they turned out! Next week I’ll be sharing how to frame a large builder-installed mirror to get a more custom look for a bathroom on the cheap. Let me know if you have any questions about painting cabinets or what you think of the project so far in the comments. We love hearing from you!